If we are human beings, we probably use the beginning of every year to reflect on the past year, make decisions and set resolutions for the New Year. It is a good thing to make resolutions, but it takes a good deal of discipline and commitment to get results that would be different and better than what we got last year. Catherine Pulsifer wrote, "The New Year symbolises the ending of one year and the beginning of yet another. We celebrate this event, yet it is only a moment in time, like any other day. But it is also considered a time when new beginnings can happen. Be determined to have a happy New Year!" Welcome to happy Bengali New Year 1426 and Pohela Boishakh. The Bangla New Year is a great time for every Bengali people in the world. We all want to start well note on every New Year. 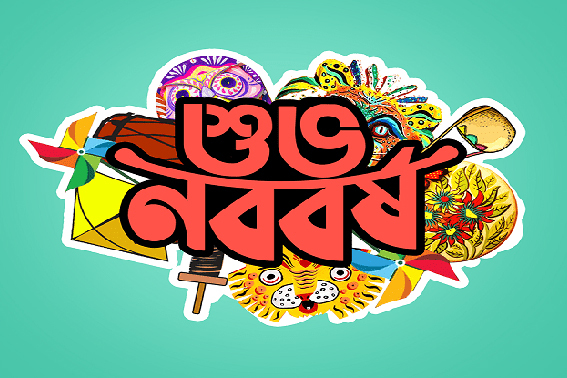 Now it is time to share Bengali New Year 1426 SMS, wishes, greetings, images and Facebook status for celebrating the first day of Bengali New Year 1426 or Pohela Boishakh on 14 April 2019. Despite all the success the country has achieved in recent years including 1426, new and old dangers – economic, political, and security-related – threaten to derail its progress. With sound policymaking, effective leadership, and enough foresight, however, can meet and defeat these challenges as well as the many more to come in the New Year. Diplomatic efforts should be more geared up for peaceful repatriation of helpless Rohingya refugees to their own homeland with due honour and respect. Pragmatic actions must be taken by the authorities concerned for having striking and admirable outcomes against unpitying road accidents and deadly infernos in the buildings everywhere in the country. Corruptions are found writ-large in almost government offices because of my long-standing experience of serving with private business firms. Moreover, people of all officers are reluctant to work. All these must receive the best attention of the government. In the New Year's foresight, Bangladesh's growth initiatives may be overarching themes that place the country at the tipping point and we perceive to be key areas for intervention to keep Bangladesh on its current rising trajectory. This year's format is different from years past, encompassing viewpoints from high-level policymakers, academics, and practitioners, as well as utilising visuals to better illustrate the paths behind and now in front of Bangladesh. The country has witnessed remarkable improvements in poverty reduction in recent years, but persistent challenges in inequality, education, health, and violence, among others, still plague it. As the 1426 year may provide the opportunity to be a jumping-off point for strong policies and efforts to accomplish the desired goals. We understand the assortment of opportunities 1425 provides for supporting human development efforts and argues for the central role that better data plays in addressing them. To explore the consequences of Bangladesh's rapid urbanisation which historically has facilitated the country transition from a reliance on agriculture to industry and jobs. However, without strong policies to deliver services, finance and build infrastructure, and support the urban poor, Bangladesh's rapidly growing cities and intermediate cities cannot deliver on their potentials. 1426 may see a number of governance milestones and obstacles and the march towards good governance. Any sort of violence, killing, destruction… shall have to be ruthlessly suppressed by the law and order controlling bodies of the government. People want peace and that has to be ensured. People do not want the anti-liberation forces and their mango-twigs to get any chance to fish out any benefits in the troubled waters at any time. Bangladesh is for Bangladesh's people. The police department must bring the fugitive war criminals and convicted fugitive war criminals to justice. The ICT should be expanded in more than one solitary court to speed up the on-going trials of the war criminals for bringing them to justice. The government should reflect on the country's growth-governance puzzle and the complex institutional changes necessary to move from economic growth to economic transformation. Historically, urbanisation is a sign of economic prosperity. As a country underwent a structural transformation, and its economy shifted from agriculture to manufacturing and industry, the composition of the population of the country shifted from being predominantly rural to predominantly urban. However, urbanisation in Bangladesh's context displays different characteristics from the ones witnessed in Asia and other countries. This growth demonstrates a great need for better urban management and institution building. Thus, if managed properly, the newly emerging cities can produce several economic opportunities as cities offer economies of scale, which can be conducive to sustainable economic prosperity and improved human development. The fact is that everyone has a different idea about what the perfect song or mood to transition from one year to the next should be. This year has a litany of challenges on the socio-economic and political fronts like the previous years. The government should successfully take over all the levers of power both at party level and in government and deliver good governance in all levels of administration…..But this is now water under the bridge and we can only hope our leaders will now address more pressing issues such as push upward the economy and dealing with bread and butter issues in a much more pragmatic manner that would put Bangladesh on its track aright as it marches towards prosperity. As I have said earlier, youth unemployment is another cause for concern because there are just too many unemployed university graduates whose numbers are swelling the ranks of the growing jobless people. Joblessness could be a recipe for social unrest and this could lead to despondency. We are hopeful 1426 will be better in terms of the number of jobs that will be created so that our youth and those who lost their jobs will be employed and that there will be more social harmony. We wish the short spring in the new Bengali Year will wash away all difficulties. We can smell the grass again, and the torn leaves being eased down into the mud. The few loves we have been allowed to keep are still sleeping on the sky of Bangladesh. Here in the country, we walk across the fields with only a few young cows for company. Big-boned and shy, they are like girls we remember. Those girls are matured now. Like us, they must sometimes stand at a window late at night, looking out on a silent backyard, at one rusting lawn chair and the sheer walls of other people's houses. They must lie down some afternoons and cry hard for whoever used to make them happiest, and wonder how their lives have carried them this far without ever once explaining anything. We don't know why we are walking out here with our coats darkening and our boots sinking in, coming up with a mild sucking sound we like to hear. We don't care where those girls are now. Whatever they have made of it they can have. Today we want to resolve many things. We only want to walk a little longer in the blessing of the wind, and lift our faces to it. Emotions and excitement will be lifted up inside eyes and mouth widely grinning hands clap together anticipation rising going through the whole body. As we wait for the sunrise, we wait for a shimmering blue sea. We shall see a beautiful golden sun. And we believe it will set us free. We put our pens down greatness without sound; love without a doubt and a heart unbound; freedom of tongues is freedom of minds, and free air is freedom of lungs. We smoke though, temporary satisfaction for eternal sorrow; one more drag; confidence to load the mag up against our heads, we then resurrect ourselves with memories of something else. So, we are grinding again, making our way up the lane. With the moon as the conductor, the symphony of lights begins. As the heavens open in anticipation, stars one by one come filing in with each rhythmic starlight flicker keeping in tune with the galaxy. Entire planets hold their breath in wonder from everlasting to everlasting nebula breeze. It all plays out in harmony keeping perfect 3-4 times and such beauty is not held by boundaries and seen and heard light years through time. The year 1426 should be to do good deeds. The winds of bearable and golden-like and sweet-note are on our heads. The winds of civility and refinements having good or auspicious marks; of commendable looks… good governance…gentleness of disposition…exquisite beauty or grace…quite consistent; very reasonable; judicious; fair; adequate; relevant; well-refined life shall prevail in our days; and we wish our readers, and people, in general, a glorified and restful festive season. Celebrate new life in the Bengali New Year 1426!